It’s a special feeling to harness the attention of seventeen teenagers, especially when your backdrop is a raging whitewater rapid and 1,200 feet of 300-million-year-old rock. 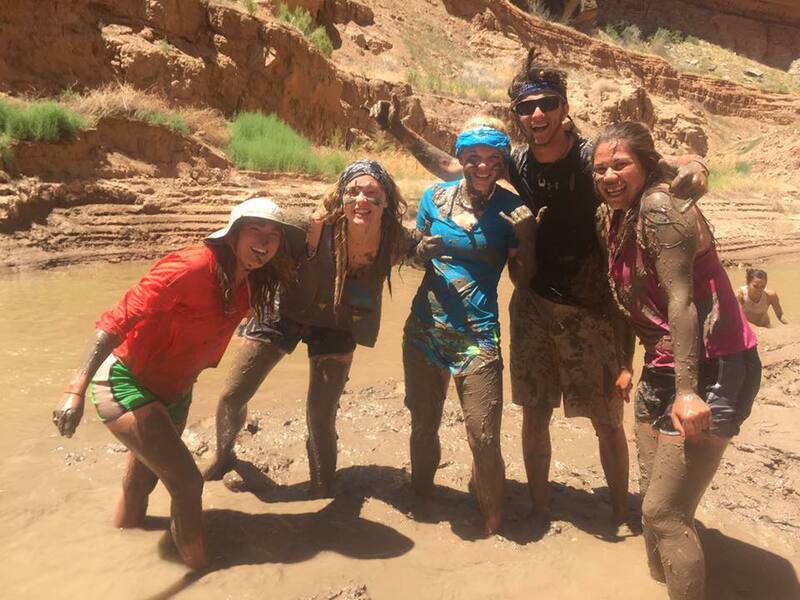 It’s not the typical classroom setting, but for this particular group of Page High School students, it’s the headwaters of their hometown novelty, Lake Powell. 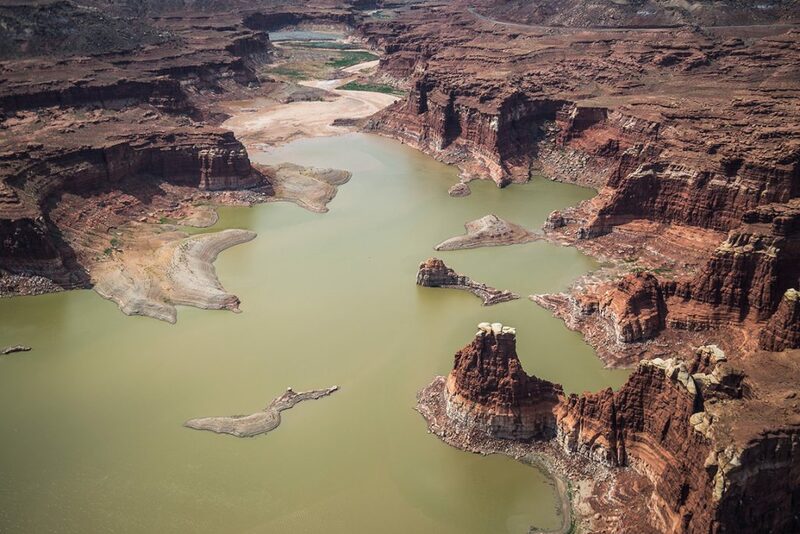 While the lake and the Colorado River have been a backyard norm for most of these kids throughout their formative years in Page, Arizona, it’s largely been taken for granted that this is not only the central geologic feature of the desert southwest, but also the vital water source for some 40 million people from Denver to Los Angeles. 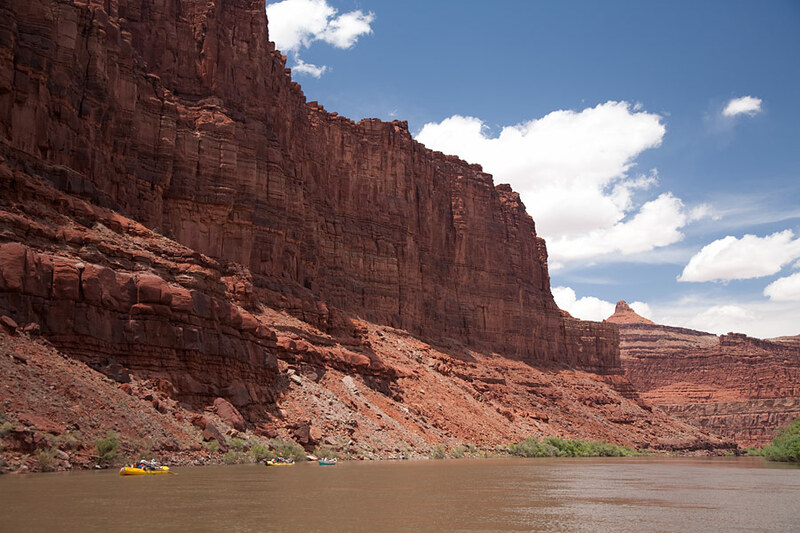 The six-day trip down river—donated by veteran river outfitter, OARS, in collaboration with the National Park Foundation, Glen Canyon National Recreation Area and the Glen Canyon Natural History Association—is no ordinary opportunity to gain a first hand experience of this tremendously beautiful and perilous resource. 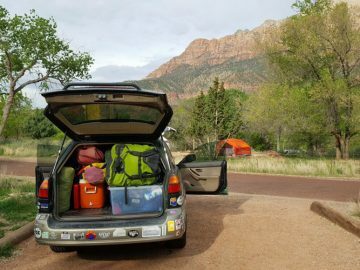 Joining this adventure are two park service volunteers—one is a biological science technician and the other a geologist. Each evening after the students have diligently helped unload what amounts to a small village of supplies onto the beach, Brad and Susie lead a talk on the local fauna, bugs and geologic formations of our surroundings. The students are surprisingly attentive once the usual chatter about who’s dating who and what’s for dinner has dissipated. A barrage of questions follow up each discussion, and as this crescendos into a dull roar that momentarily drowns out the whine of cicadas, wood house toads and the roaring river, it seems as if the landscape ignites for these students a genuine curiosity about their surroundings. Eventually students wander off to their tents, and as the last giggles echo off the canyon walls, the riverside village quiets for a few much-needed hours of slumber. In the morning the river beckons again and the small flotilla breaks free from the shore. The cliffs are speckled with ancient Puebloan granaries perfectly camouflaged among the rock walls. We stop for a mid-morning hike up to some of the better pictographs and granaries in the greater Canyonlands region. Handprints and a number of abstract figures line a section of wall mid way up a shaded Mesa. Our river guides elaborate on the many speculative theories about the hand prints and what is known as the great abandonment, a time when the ancient Puebloans left their homeland en masse due to some combination of resource scarcity and encroaching enemies. We examine the flood plains where they would plant their crops after the summer Equinox, an event believed to be marked by the sun’s shadow on a particularly cryptic pictograph. It’s a wonder to marvel at these ancient people’s existence in this harsh wonderland, at once so removed yet eerily real as we examine their fingerprints still freshly embedded in the clay mortar. If the ancient ruins aren’t enough to send a 16-year-old’s mind spinning, then Susie’s explanation of ancient sand dunes, ocean beds, swamplands and traveling tectonic plates certainly are. The towering walls, so impossibly solid and impenetrable, have lived a far more dynamic existence than one might imagine. The canyon takes on a whole other meaning for the remainder of our trip as we sail effortlessly through millions of years of geologic masterpieces. 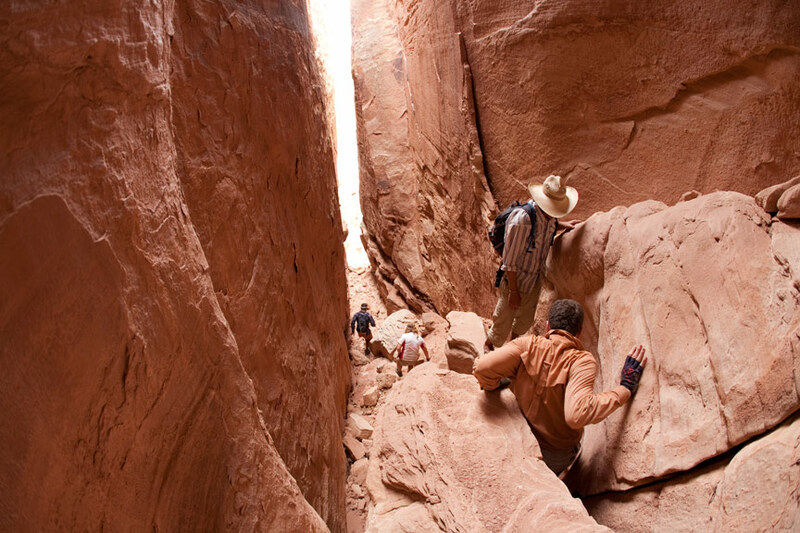 The following day we hike up to a remote section of the Maze, the least visited region of the Canyonlands National Park. It’s a moving spectacle, and after the boys have completed their masculine right of passage by urinating off the three hundred foot cliff face, the group meanders past another secret granary, an ever-growing sinkhole, and into a little gem known as “the refrigerator.” It’s a system of caves and cracks along a fault line and an excellent lesson in the value of passive cooling as we briefly escape the hundred-degree desert inferno. Here the students learn how the strange formations sprung from the rock bed. There is some snoozing and exploring, an occasional golden moment of silence, and then the troops march on into the blazing sun. Our dip in the river after the sweaty descent is sweeter than stolen honey. We spend the rest of the afternoon lounging. Anticipation is in the air. The next morning will mark our biggest day of rapids to date as the river descends abruptly through a series of major drainages. Marked with colorful names such as “Capsize,” “Little Niagara,” and the “Claw,” the run culminates with the notorious “Big Drops,” a series of—you guessed it—big drops in the river bed where a furious 30,000 cubic feet of water continuously pours over every variety of boulder and ledge. The guides are up at first light the next day rigging their boats and tying down any loose odds and ends. We eat a quick breakfast and gather round for a whitewater safety chat as a stack of cherry red helmets is passed around the circle. Our trip leader Peter is thorough, but still manages to keep the talk fun. It’s clear he speaks from experience and not hypotheticals. These are skills that could save any of our lives today or in the future, and the students’ focus is sharp as a needle. Today the boats peel off one by one, spaced such that each can be an aid to the others in case of a flip, yet keeping a safe distance for the same reason. 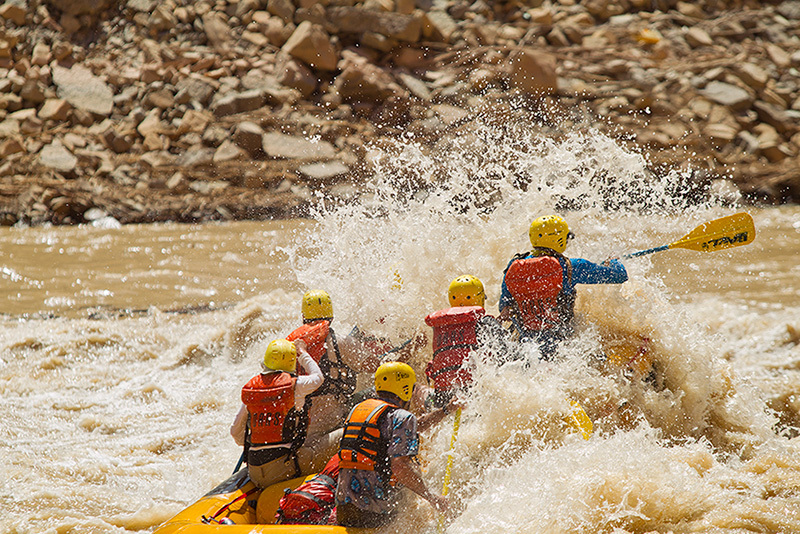 They bumble down the first few rapids with relative ease and eddy out above a jarring spectacle. Here, the brown river is momentarily transformed into a gleaming white frenzy of crashing waves and pulsing explosions of mist. The guides stare intently, debating their lines, and for a moment the students stand silently, faced with the ferocity of the river, which till now has been closer to a summer amusement park than a blender run wild. As the boats disappear one by one over the horizon, the screams and cheers are lost to the roaring water. Before we know it we are diving head first through waves large enough to swallow an 18-foot raft and spit it out like a wind swept leaf. We just barely scrape by the first set of monsters, leaving enough time for a few concentrated breaths before we are hurled down the next cascade of waves that send a neighboring boat clear airborne. It’s more than any water park enthusiast could ever hope for. In a few minutes, the whole parade is parked safely in an eddy, unscathed. The boats erupt with cheering, laughter and enough high fives to mimic a full-blown standing ovation. The next few days are mellow. A few side canyon hikes, a miraculous group meditation by a trickling waterfall, morning yoga sessions and of course some riverside clay harvesting. 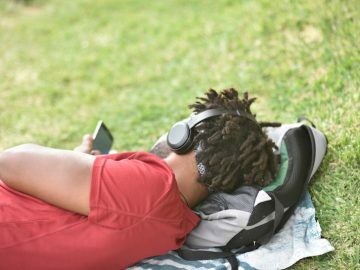 The instruction becomes less regimented, and in its place, the students seem more inclined to pursue their own interests. Voluntary bug examination, questions about the shifting formations, quiet fireside sculpting sessions—it’s not what one might expect from a rowdy group of teens set loose in a wild canyon. There is a subtle gratification in watching this transformation unfold. 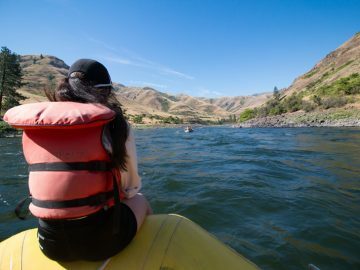 None of the instructors can point to what exactly has changed, but the students have a spark in their eye and a newfound keenness for the simple pleasures of river life. There is some moaning and groaning about the trip flying by too quickly, and one student asks me if he can stay out here forever. Another group rapid fires questions at the guides about how they landed their dream jobs. It seems the canyon’s charm has reached more than a few. Before reaching our final night’s camp, the guides open up a Q&A about Lake Powell and the dam. By now the once roaring rapids of lower Cataract Canyon have been subdued by the lake’s silted waters. We read the poem Floyd’s Void aloud, an ironic and playful poem about the Bureau’s decision to build the dam. There is chatter about Edward Abby and his dam busting gang and we learn with great surprise that it’s the first time many of the students have discussed this topic so seemingly close to home. Perhaps inspired by the ruckus discussion, the guides seize an impromptu opportunity to demonstrate the glory of dam busting firsthand. At the mouth of a rugged drainage, the students scramble to dig a small passage through a mud dam that has blocked a pool of stagnant water as the river receded. With some coaxing, the trickle slowly grows to a raging flood before our eyes, draining the mosquito cesspool in matter of minutes. It’s a stunning display of canyon formation and a sobering reminder of the power of flash floods. We cap off our last night with the first glow stick dance party to ever grace the northern reaches of Lake Powell. Unbeknownst to us, a number of our river guides are every bit as talented on the dance floor as they are behind oars. Before things get too wild, a late night thunderstorm booms through the canyon and sends us scrambling back to our tents. It’s not clear whether the guides or the students had more fun. We fly out the next day. It’s many of the student’s first flight, and an exciting one at that. One by one the colorful little planes scream off the runway and immediately bank left, circling back over the river. We fly low, soaring over features we rafted through just days before. Across from the big drops is a roaring three-tiered waterfall fed by the previous night’s rainstorm. Just a few miles further we spot a magnificent view of the confluence of the Green and Colorado rivers. This time, the Green really does look its color compared to the mud slurry that is the Colorado. The two monsters mix gloriously into a marbled tapestry before taking on a more homogeneous hue downstream. It’s been a phenomenal week of riverside fun. The whole experience is a cohesive reminder of the true priorities in life. It’s undoubtedly a breakthrough for many of the students, and they make a point to let us know. The whole thing has been a pure blast, and if any learning happened at all, it was camouflaged behind the smiles and screams of a thousand stunning experiences. And why not? It’s the way learning should be—hands on, dirty, filled with fun and fear and friendship under the blue sky and starry nights. Nothing feeling forced, everything just flowing like the river through ten thousand twists and turns, a lesson learned at every bend. It’s a crash course in people making, a reminder of our tiny selves on a big spinning planet that politely puts up with our blunders and still puts on a fantastic sunset every night. Maybe a week on the river won’t solve your next algebra problem, but let’s face it, these kids are about to take the reigns of a wild world and we need a generation prepared to do more than keep the books in the back room while life rushes by. So cinch that life vest, strap those shoes, and let’s go learn a thing or two in the greatest classroom of all—the only one that ultimately matters. Zane Bridgers is a freelance videographer, web developer and outdoors enthusiast residing in Page, Arizona. Zane has a BA in Sustainable Development from Colorado College and is passionate about fostering a strong ecological ethic in the new generations.